Logic was nominated twice for "Collaboration" and "Video With A Message" at the 2018 MTV Video Music Awards. Logic made sure that everyone watching got the message loud and clear. 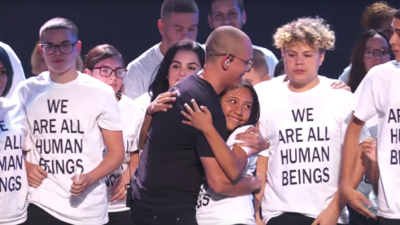 The performance begins with Ryan Tedder was on the piano and then Logic out in the lobby wearing a "F*ck The Wall" t-shirt and dozens of kids from all walks of life following him wearing "We Are All Human Beings" shirts while getting a standing ovation. The video wall rises and then many more kids appear where they hug each other and break out battery operated candles in unison.